Our guest today is Josh Fox. He’s the director of the documentary “Gasland,” which aired recently on HBO, and is screening at film festivals and theaters nationwide. 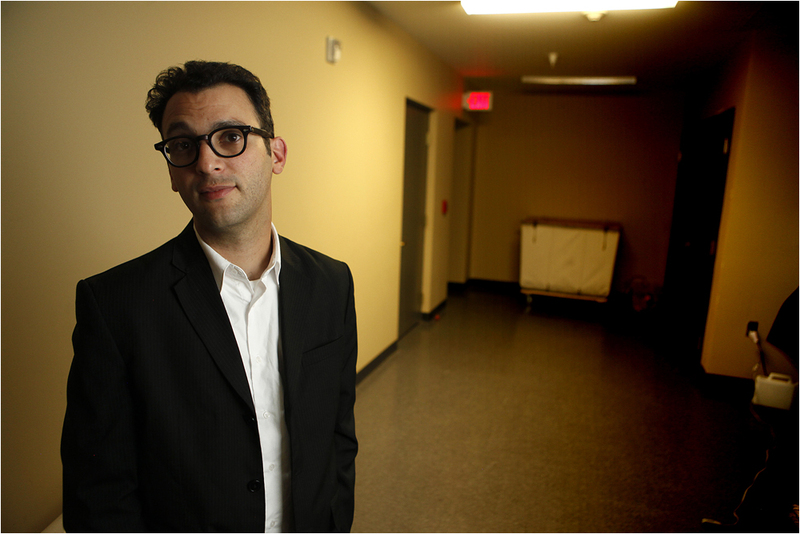 “Gasland” director Josh Fox began his national investigation on natural gas excavation after a company approached him with a $100,000-offer to drill wells on his land in Pennsylvania. Welcome to Circle of Blue Radio’s “Five in 15,” where we’re asking global thought leaders five questions in 15 minutes, more or less. These are experts working in journalism, science, communications design and water. I’m J. Carl Ganter. Today’s program is underwritten by Traverse Internet Law, tech savvy lawyers representing Internet and technology companies. You’re here in Traverse City. You are on a tour, you’ve got this new film, [and] interest is high. Where are you going? What’s happening right now? Josh Fox: “Gasland” premiered in a national way on HBO on June 21, but prior to that, and subsequently, we’ve been touring all the affected areas—and there’s an enormous amount of affected areas. We’ve been kind of barnstorming through New York and Pennsylvania, and now we’re about to go out west. We’ve done screenings all over the country. What they are for us is a kind of effort to support the grassroots. I mean, there’s a movement about this issue unlike anything I’ve ever seen in my life—200 organizations in New York and Pennsylvania just cropping seemingly overnight, but [especially] over the last year and a half, because there’s so much interest about what’s going on with the Marcellus Shale. I know here in Michigan there’s the Antrim Shale; pretty much the whole state could get fracked. Everywhere I’m going we’re met by these huge crowds of people who are incredibly worried about their water supply, about their air, about their health, about the character of their areas getting taken over by this on-shore drilling, which is, you know, as I show in the film, incredibly toxifying of the landscape. You’re making the tour. You’ve got a film. Urgent calls, off the record tips…Tell me more about the evolution from filmmaker to reluctant investigator. You say “reluctant investigator” in the story. When did your personal journey really become part of a larger journey, integrated with stories of others, and how did this affect you? Josh Fox: There wasn’t a lot of information or not enough information about hydraulic fracture and gas drilling when I was approached to lease. The way this whole process started was that my family was asked to lease our land in the Upper Delaware River Basin—we’re in Pennsylvania, but it’s the New York-Pennsylvania border—and that’s a part of a watershed area that provides water to about 16 million. It’s a pristine area. It’s beautiful, and it’s not something I wanted to see industrialized. But at the same time, the industry comes in, and they say, ‘Well, it’s not that invasive. It’s a minor procedure. You’re hardly even going to know we’re here.’ And then the environmental groups from all over my area were shrieking, talking about the injection of toxic chemicals into the land, problems with water contamination, problems with air. I just needed to find out for myself exactly what was going on and take it very, very seriously. The question was always, ‘All right, well, maybe I’ll interview some people.’ And then the minute that started, it seemed like the whole country started to respond. We got calls and e-mails from people just after contacting one or two people. Then, all of a sudden, there’s this incredible outcry of wanting to be heard coming from the West, because people weren’t really being listened to. I actually had no idea what I was going to find. I started off doing a five-minute [film]. My idea was like a five-minute film that was going to give people some information on the topic. When I discovered what was actually happening—that the Bush-Cheney government had proposed a bill (and got it through Congress) that exempted hydraulic fracturing from the Safe Drinking Water Act—that was in 2005—then I found that there were exemptions to the Clean Air Act, the Superfund Law, the Clean Water Act, which is separate from the Safe Drinking Water Act. I couldn’t believe what I had uncovered. Then I got completely sucked in. It’s an amazing story. I’m very worried about our drinking water supplies. I’m very worried about the toxification of the landscape. When I first started to see this, it was like people in Dimock, Pa.—one of the first areas that was drilled in Pennsylvania—could light their water on fire. Their kids were getting sick. Their animals were getting sick. It was this insane mystery, and everybody around there was totally afraid and freaked out about what had happened, because land men had come in, had promised them riches and then had trashed the place. The town had been completely taken over, and turned into a sacrifice zone and an industrial zone. Then I found this story repeating itself over and over, and over and over again in Texas, Colorado, Wyoming, New Mexico. I got desperate e-mails from people in Michigan. All of Michigan is over a huge unconventional gas field. I would be worried. In a sense, you’ve become the frack star. You’ve gone from behind the camera in producing this piece to evolving to being the central hub of organizing and grassroots. How’s that changed you? And then even looking forward, what role do you feel that you and “Gasland” will have played in this issue? Josh Fox: I certainly hope that there’s a role it will play in changing the laws. At our website gaslandthemovie.com, you can go and fill out a letter that you send to Congress in support of the Frack Act that would re-regulate gas drilling under the Safe Drinking Water Act, which is really significant, because the process injects toxic chemicals under the ground. We are really hoping that pieces of the Frack Act pass this summer or that the whole Frack Act passes eventually. And then at the state level there are regulations. I think, we’re looking at a moratorium bill in New York State. We would have never been looking at that a year ago. It’s amazing. But that’s not just due to the film. There’s an incredible…I mean, literally wherever we go, there are hundreds of people, if not thousands of people, showing up to talk about the issue. I think, the film is very visible. And, certainly, I want to play a role there, although I’ve never made a full-length documentary feature. This was the second film; the first film was in 2005. My theater company International WOW Company, which is in New York City and premieres work all over the world—but it’s something I’m comfortable with doing—but at the same time, it’s amazing to see this unbelievable attention on it. I think that’s because it’s a huge issue. There’s already an audience. Before we even premiered the film, we had 250,000 people watch clips on our website. That just shows how many people are affected—when there’s an issue that this many people are invested in and involved in. It’s so widespread. You’ve been criticized by the gas industry, and you answer their charges line by line. Tell us a little bit about the industry response and what you’re thinking about as you’re producing and editing the film. They’ve been going out there and denying this for years. Their power in Congress is well shown if they can get these exemptions passed. I think that it’s outrageous, and I think that obviously it’s a travesty of our American democracy system. This just reflects how powerful oil and gas lobbies can be, how much their PR machine can come out swinging against reality. They can state black is white, and then the newspaper will run the story, even though it’s blatantly untrue. This is a problem. I happen to believe that even though they’ve got huge treasure houses of funds available to slander people, the truth is definitely not with them, and the numbers are definitely not with them. The numbers of people who are adversely affected by this vastly outweigh the numbers of people who are benefiting from it. Jaime Long, a resident of Cheboygan, Mich., claims her poor health and confinement to a wheelchair are due to the exposure to toxic gases released in a natural gas drilling accident. Fox says he encounters stories like Long’s throughout the country. There’s even a bigger picture here. Did you get a sense that a nation can make a transition to this low carbon economy? One of the big arguments for natural gas and for this aggressive exploration and extraction is that we need a bridge fuel. Did you get a sense that there will be a transition without these huge trade-offs? Josh Fox: This whole bridge fuel argument is one that’s been proposed by the natural gas industry. This is not altruism. This is not oil and gas trying to save the world. This is them trying to make a buck. If they were trying to save the world, they would be complying with the Safe Drinking Water Act, the Clean Air Act, the Clean Water Act, and the Super Fund Law when they’re doing their drilling. This is not about that. This is about their bottom line. This is about their profit. …if the industry had to pay for the sites that they messed up, if they had to pay for water treatment for the history, for the foreseeable future, for water treatment for watersheds that they’ve poisoned, natural gas would be far more expensive than renewable energy. Renewable energy would be able to compete. It’s cheaper for them to toxify the landscape and push the costs onto the citizens than it is to include that in the price of natural gas, because if it was included in the price of natural gas, if the industry had to pay for the sites that they messed up, if they had to pay for water treatment for the history, for the foreseeable future, for water treatment for watersheds that they’ve poisoned, natural gas would be far more expensive than renewable energy. Renewable energy would be able to compete. Nobody’s saying coal and oil are going to save the world. But they are out there somehow, amazingly, saying natural gas is going to save the world. That’s because of information that’s incorrect. They say that natural gas burns cleaner than coal. Well, that’s true once you get it, but the entire life cycle of natural gas emits so much pollutants and greenhouse gasses—including methane, which is 25 times the greenhouse gas of carbon dioxide—into the atmosphere that, in fact, it’s debatable whether or not natural gas is better than coal, which is the worse fuel that we have. All these arguments are proposed by the industry. They’re not the reality. We don’t have to transition from one fossil fuel to another fossil fuel. It makes no sense. We should be moving to renewable energy for our electricity needs as soon as we possibly can. That’s doable. We know that it’s doable. What’s in the way? Natural gas is in the way. If you’re interested in climate change, if you’re interested in the issues of how energy works, the main battleground right now, I believe, is with natural gas. If we were to use natural gas as a so-called transition fuel for the next 50 years—because once you build those natural gas power plants, they’re going to be around for a while—the build-out, including all the pipelines and new plants, is about $700 billion, which you could put towards renewables instead of building pipelines across everyone’s front yard, taking eminent domain, taking their property, toxifying the landscape. It makes absolutely no sense to move in that direction. So this is largely a water film. Tell me what you’ve learned about the intersections of water and energy? Josh Fox: What I’ve learned is that everywhere the industry goes, there’s water contamination. What I’ve also learned is that they’ve been successful in shutting down most of the investigations that have been called upon for the last six, seven years. Currently, natural gas fracking is under the investigation of Congress in two different ways, and they are under the investigation of the EPA. During the Bush [administration], all those investigations were asked for, but they were shut down. What I’ve learned is that it’s very, very difficult to prove that without a talented agency like the EPA, and that citizens have been out there trying to prove it. They have water tests that show these contaminants and toxins related to the fluids that they use to drill. They can show that those things are in their water wells. They can show them in the ground water. They can show benzine in ground water. What we need, though, is a talented agency to come in and tell us exactly what’s going on. That’s what’s happening now. In the meantime, however, the precautionary principle needs to be put in place when you’re talking about water supplies, because you can’t clean up an aquifer. You can’t fix it. You have to stop the contamination before it occurs. If there’s a risk, they should be stopping the activity that’s causing the risk, which means a moratorium on this kind of drilling, permitting and leasing nationwide. That’s what we’re looking for here. Because the water is too important. You can have a few short years of energy with natural gas. Even if that’s 50 years, that’s short in comparison to the toxification of the water supplies forever. But you’re going to have no choice but to treat that water at the surface, and that causes a lot of money and energy to be used. This is storytelling, documentary storytelling. Your style is personal. It’s kind of gritty and visually creative. Tell me a little bit about your approach when you’re doing a piece like this, just the way you shoot it, the way you approach it. It unfolds in front of us. Tell me a little bit more about that. Josh Fox: My history as a playwright/director is that of doing things that are weird, interesting, bold, fun, of framing things that would ordinarily be like take your medicine, in a way that would be entertaining, dramatically exciting. I don’t know. It’s an instinctual thing when you think about directing something. I had started the voice over stuff as something that was like a placeholder. It’s like, ‘I’m going to explain this now. Maybe we’ll figure out the way to do this later.’ Then friends of mine said, ‘Hey, you know, that’s pretty good. You should keep that.’ The last-minute inclusion, in fact, in terms of dealing with the structure, was me. I didn’t think I was going to be in the film. Matt Sanchez, the editor and co-creator of the project, said to me, ‘You know, look, I think this is your story. You’ve got to go with it.’ Matt and I come to it from the point of view of the avant-garde, of also experimenting. But we also wanted to make the movie funny in any way we could, because there’s this kind of gallows humor that happens when you can light your water on fire. That happened with the people, so we wanted to bring out that element within it, because otherwise it could be a very dark subject. We wanted to make sure people actually watched the film. What’s next? What’s after you become the hub of this national issue and you’re a filmmaker/playwright, what’s next? Josh Fox: Of course, we will continue to work with the International WOW Company. We are doing a project called “Reconstruction,” which is about creating sustainable theaters, because theaters actually burn a lot of energy, and we wanted to take a look at that. Where are we getting energy from? I wanted to find out about renewables. We’re going to make a project about renewables and about the solution. You always want to make discoveries within your work. I think one of the questions that people had coming out of the movie, at least yesterday when I watched it, was looking for ‘What can I do?’ Again, back to how we make that change? What do I do right now? Again, what’s that bigger picture? Where do I fit? How do you answer that when people ask you that? Josh Fox: This is why we’re on this tour. There’s so much people can do to get involved. At our screenings, we’re trying to hook up the audiences with the local organizations that are active. At our website, we’re doing the same thing. If you go to the website, you can click on any state. It will connect you to organizations that are national organizations, and there are local organizations. We want to be a conduit for people to be able to get involved, obviously at a government level, dealing with the federal government, your Congress people and senators, dealing with your state government and that state assembly, state senate, trying to get legislation proposed and passed at that level. Certainly, letting your representatives know that this matters to you. For states that are not affected, even though there are 34 states that are affected, a lot of states have down water issues, like Los Angeles gets all of its water out of the Colorado River. The Colorado River is being fracked to hell out of its headwaters. People in Los Angeles should be concerned. It’s so important, definitely, definitely important that people get involved. It’s fun. Josh Fox, director of “Gasland.” Thanks for joining us. Josh Fox: All right, man. Thank you very much. I spoke with Josh Fox at the Traverse City Film Festival in Traverse City, Mich. He’s the director of the new documentary “Gasland”. To find more articles and broadcasts on water, design, policy and related issues, be sure to tune in to Circle of Blue online at 99.198.125.162/~circl731. Our theme is composed by Nadev Kahn, and Circle of Blue Radio is underwritten by Traverse Legal, PLC, Internet attorneys specializing in trademark infringement litigation, copyright infringement litigation, patent litigation and patent prosecution. Join us gain for Circle of Blue Radio’s “Five in 15.” I’m J. Carl Ganter. Opinion: Water, Water, Not Quite Everywhere? When we think about what Josh Fox can bring to an informed debate about environmental issues, let’s remember one of the most flamboyant and emotionally-charged images from his documentary hit-piece “Gaslands” – a rural resident lighting their tap water on FIRE! What Josh failed to mention in a spectaculary dishonest bit of artistic license/omission – was that residents across PA and other eastern states could always light their tap water on fire – thanks to naturally occuring methane documented as far back (as Josh later acknowledges, but not in the movie) since 1937. It took Josh’s flair for the dramatic to actually imply the gas industry in general was the cause of this – it isn’t – and that the hydraulic fracturing process specifically, was to blame – and its not. So much for unbiased, calm appraisal of FACTS upon a legitimately important issue.